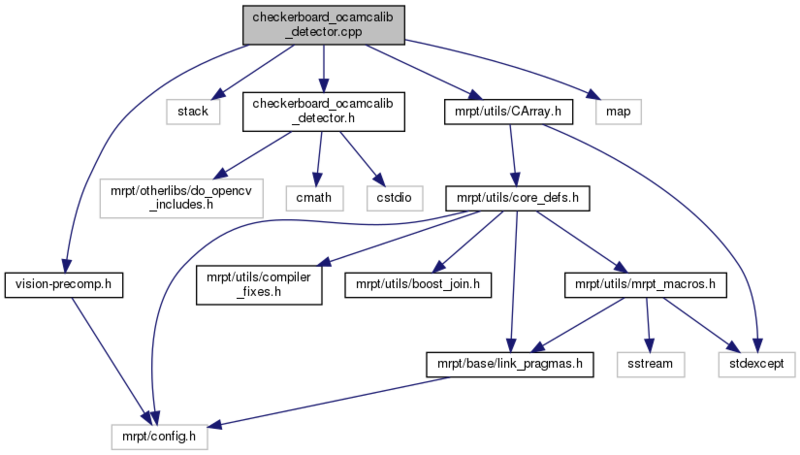 Definition at line 66 of file checkerboard_ocamcalib_detector.cpp. Definition at line 193 of file checkerboard_ocamcalib_detector.cpp. References CH_GRAY, do_special_dilation(), mrpt::utils::FAST_REF_OR_CONVERT_TO_GRAY, mrpt::format(), mrpt::mrpt::format(), mrpt::utils::CImage::getAs(), mrpt::utils::CImage::getHeight(), mrpt::utils::CImage::getWidth(), icvCleanFoundConnectedQuads(), icvFindConnectedQuads(), icvGenerateQuads(), int(), MIN, mrAugmentBestRun(), mrFindQuadNeighbors2(), mrLabelQuadGroup(), myQuads2Points(), mrpt::utils::CImage::saveToFile(), and mrpt::system::os::sprintf(). Definition at line 70 of file checkerboard_ocamcalib_detector.cpp. Referenced by cvFindChessboardCorners3(), and find_chessboard_corners_multiple(). Definition at line 767 of file checkerboard_ocamcalib_detector.cpp. Definition at line 953 of file checkerboard_ocamcalib_detector.cpp. Definition at line 1988 of file checkerboard_ocamcalib_detector.cpp. References CvContourEx::counter, mrpt::utils::CImage::getAs(), mrpt::utils::CImage::getHeight(), mrpt::utils::CImage::getWidth(), MAX_CONTOUR_APPROX, and MRPT_UNUSED_PARAM. Definition at line 754 of file checkerboard_ocamcalib_detector.cpp. Definition at line 1652 of file checkerboard_ocamcalib_detector.cpp. References mrpt::obs::gnss::a1, mrpt::obs::gnss::a2, mrpt::obs::gnss::a3, mrpt::obs::gnss::b1, mrpt::obs::gnss::b2, and mrpt::obs::gnss::b3. Definition at line 1428 of file checkerboard_ocamcalib_detector.cpp. Definition at line 1011 of file checkerboard_ocamcalib_detector.cpp. References CvCBQuad::corners, CvCBQuad::count, CvCBQuad::labeled, and min. Definition at line 2165 of file checkerboard_ocamcalib_detector.cpp. Definition at line 2333 of file checkerboard_ocamcalib_detector.cpp. Definition at line 746 of file checkerboard_ocamcalib_detector.cpp.